The Kerry Blue Terrier is a gifted dog that has several different personality traits wrapped in one canine. They are great hunters that can also offer guarding or protection is need be to aide their owners in security when needed. They, like most dogs adore chasing and running in an open space and will become more reserved when they are indoors. They may not exactly welcome strangers into their homes, but they do not become overly aggressive with them either. They can get rowdy with smaller animals and other canines, but generally speaking the Kerry Blue Terrier is well mannered and has good behavior. The Kerry Blue Terrier is an active creature the will require a loving and active family to raise them. Engaging in playing a game or running and/or walking on a daily basis is another requirement of these canines as they will need to exert themselves or they can begin to get rowdy and unsettled as a result of their own boredom. It has an ideal living environment that provides it with time to reside inside as well as outside. They can live in a color or warm climate and can be rather easy to train compared to other breeds. Great watchdogs and they adore protecting their families on a daily basis, the Kerry Blue Terrier is a tough dog with a sweet appearance. They will also need their grooming needs met as far as their thick and curly fur coats that will need combed and cut regularly. The major health concerns that the Kerry Blue Terrie can have a tendency to develop is cerebellar abiotrophy and a few minor ones as well. Eyesight issues such as cataracts as well as KCS, CHD, entropion, otitis externa are also common. In rare occasion they can develop retinal folds, XI deficiencies and other clotting ailments. The vet may recommend eyesight screening for the animal as they age, which is all normal for any dog. The average lifespan of a Kerry Blue Terrier is from twelve to fifteen years long. They generally weight around thirty to forty pounds as full grown dogs. 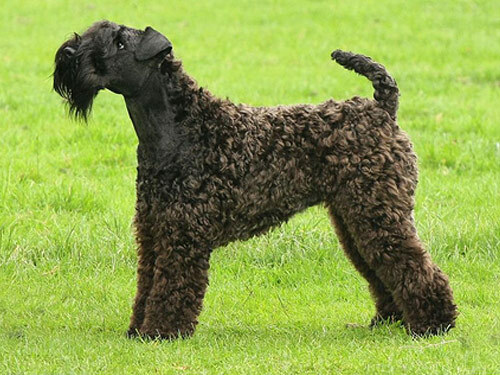 Originating in Ireland in the 17th century, the Kerry Blue Terrier has grown a reputation as a great farm dog and one that loves to hunt small vermin. They can retrieve birds and even heard sheep and cattle if needed to. They are very intelligent and like being working dogs. They began being presented in dog shows in the 19th century in the United States as well as in England and they became quite popular from there on out. Receiving their AKC nod in 1924, the Kerry Blue Terrier was given their distinct name by developing those blues shades of color when they were anywhere from nine months to one year old. They can easily be great dogs for law enforcement work and are known to be quite the trailing canine as well. In the past they have also been noted under the name Irish Blue Terrier and they also are still very common household pet.